So perfectly matched! Love how elegant this looks! Love the red suit, you look fabulous. 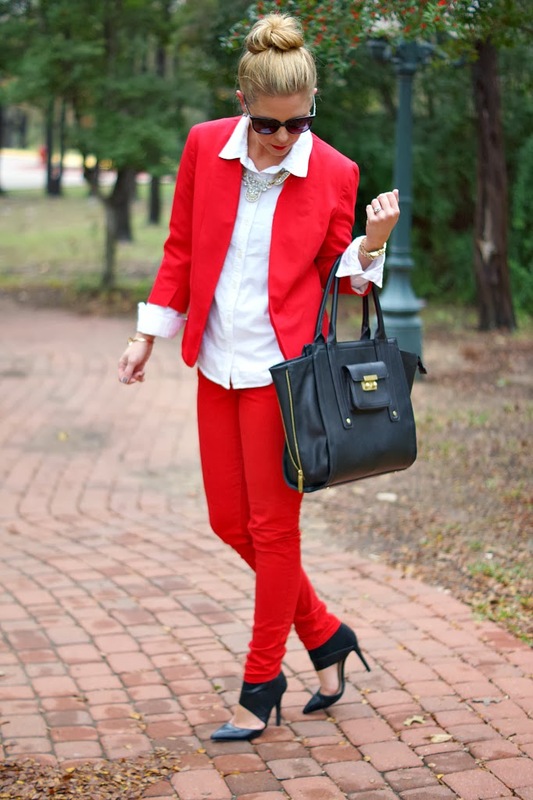 This look is chic and stunning! 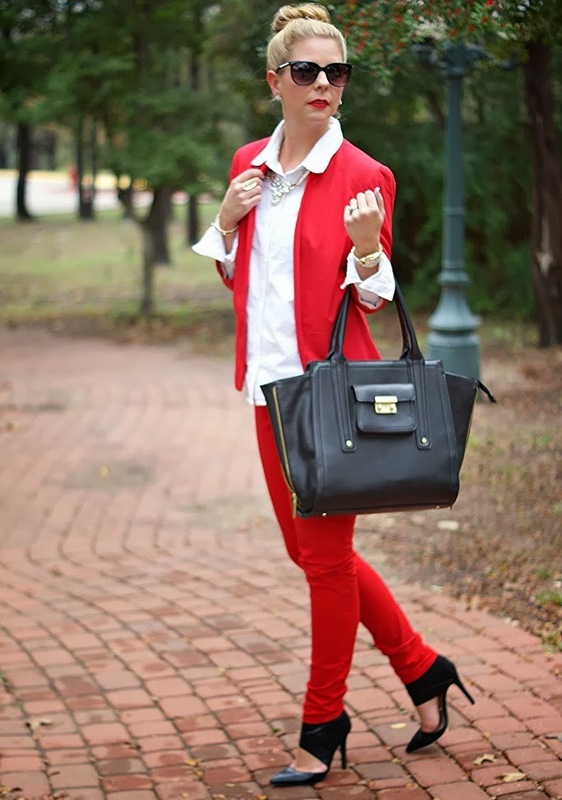 Red is a great color on you, lady! LOVE that necklace so much. I need it. That bow bracelet and those shoes! Ugh I love them so much! I love this. Taylor swift did a red pants suit awhile back (minus a shirt under it but hey, it's Hollywood) and it made me swoon. It gives you an elongated appearance wearing one color head-to-toe, and bonus points for you that it's not black! I like the jeans, but I do wish they were shorter so we could see some ankle. With the shoes, your feet are super covered up! I don't know why that bothers me. It still looks great! I bought that exact necklace on ebay for $5. 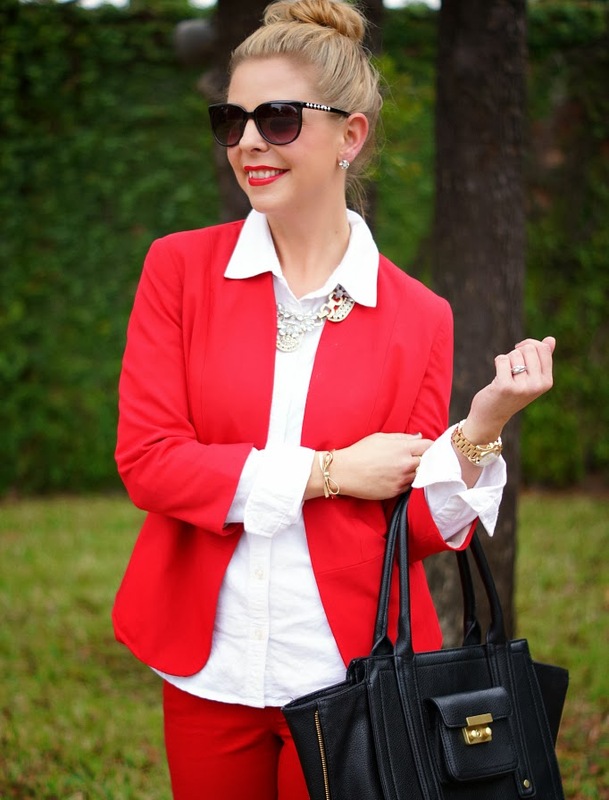 Love the bright colors for fall, and loved the shopping cart pic! I am SO behind my blog and magazine reads! I love the red though. You look fab! PLEASE show pictures step by step of how you get that bun. BEGGING YOU. OH MY GOD I love those shoes! I have absolutely no need for them but they are fantastic! 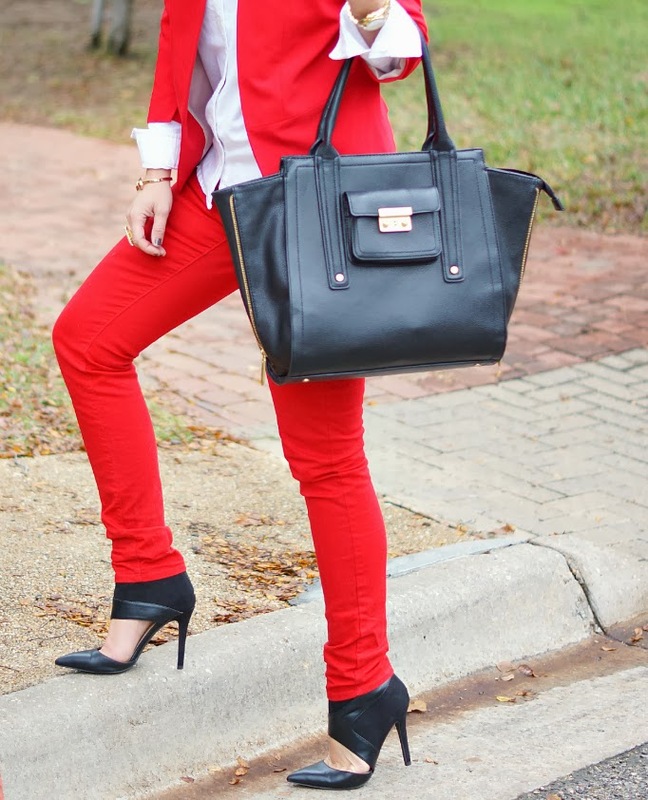 It's funny but I just wrote a post for Social Moms (due Thursday) titled, Red Hot Red. It is such a fabulous color and one of my favorites but I haven't worn it in the last few years. I've been making more of an effort to do it though. Love this outfit! I'm never sure how I feel about trying the monochromatic look, but after seeing how you styled it I think I'll try it out! girl red is your color!! soooo pretty! Such an amazing combo, Shanna–you look stunning! You look gorgeous in red, Shanna! Festive for the holidays! Hottie!!! You look amazing in red, love this look girl! I can't believe that isn't a matched suit! The shades of red are perfect matches and that never happens. Well done you. Shanna, you look gorgeous in red! This is a risk that's worth taking Shanna.....head to toe red with the right touches is a winner in my eyes!!! Those shoes are amazing!!! You have amazing style girl! I love this look!! Those magazines always have such great inspiration!! I hope you have a fabulous Thanksgiving! The red is PERFECTION on you! Love it!!! Red is a great color on you Shanna! You are rocking it in this outfit!! Lady in reddddd..... ow owww! This outfit is HOT! I love the shoes, as well as the jewelry. I'm often inspired by outfits I see in magazines and on blogs as well. Great styling, Shanna! You look freakin' gorgeous!!!! Love this outfit! Shan you are rocking this outfit, I love it! I remember you talking about it a little while back saying how you loved the same color pants & blazer and you definitely nailed it! love ya! I have been really into red lately! You look great! I would be WAY too scared to pair two bold colors like that on top of each other but you rock it so beautifully, of course ;) & I'm loving those shoes!! 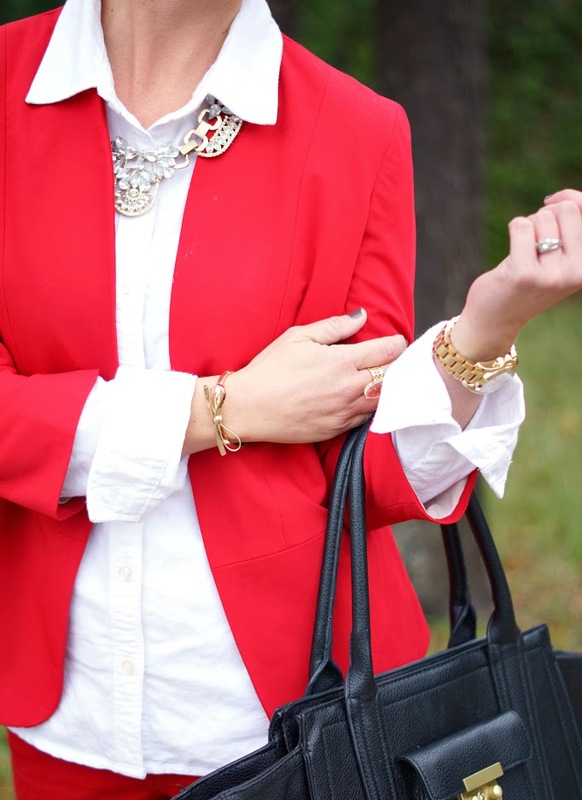 Love that necklace! The whole outfit looks great on you! 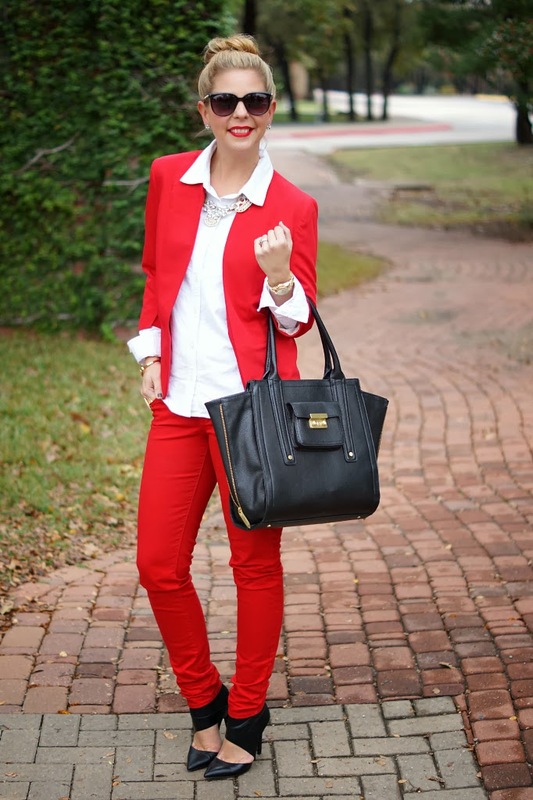 Loving this all red look, you are rocking it girl! Absolutely GORGEOUS! Love this look! Gorgeous outfit! We love the color coordination! amazing outfit! this campaign was soo fun yea?? Hands down my favorite outfit that you have posted. Your blog has provided a great source of inspiration for me and this one was tops!!! My God you are gorgeous! 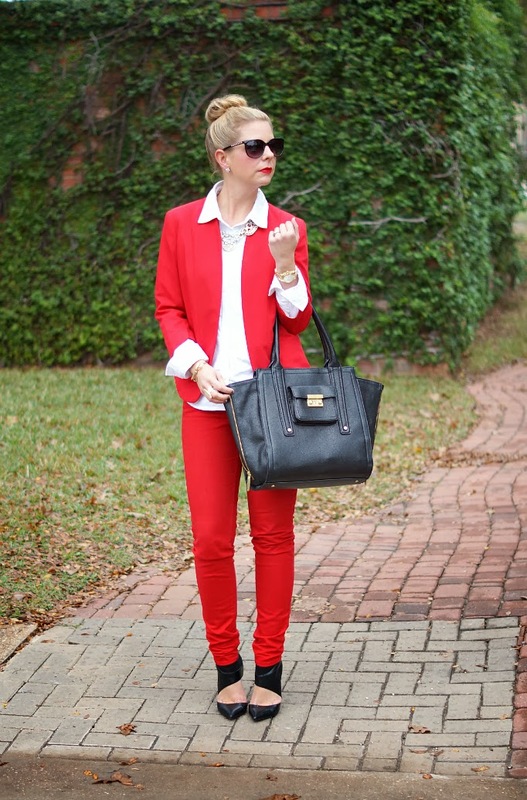 I love the monochromatic red on you!